Lion DiskMaker and Mavericks : yes, it is coming ! Happy new year! Lion Diskmaker 3 beta1 available now ! 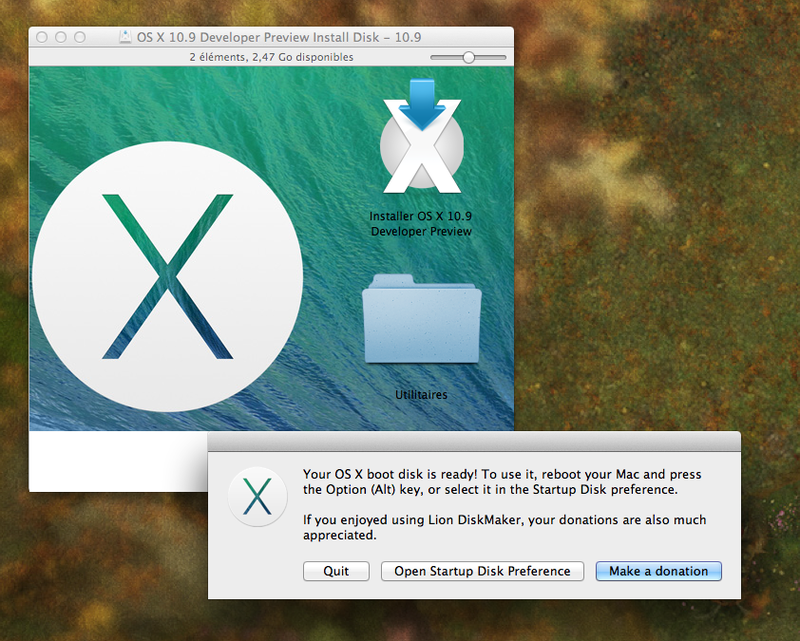 If you were still wondering… Yes, Lion DiskMaker will support OS X 10.9 Mavericks ! Don’t fill a bug to tell me that the icons’ titles lack contrast on this background, I already know it. I’ve got a build running quite nicely at this time, and I hope to ship this beta version later this week. It will support the first Developer Preview of Apple’s next generation OS. – Synchronization : this should be quite neat. Instead of erasing the full disk, LDM will detect if you already used it to build a USB thumb drive and will propose to update the thumb drive with a new version of OS X if it detects one on your hard drive. Should be fun (if it works properly). However, it will probably delete completely the DVD burning process, as it proved to be flaky at least. Instead, it will propose to build a disk image (DMG file) which you will be able to burn yourself on a dual layer DVD. That should be cool. Lion Diskmaker 3 will need an 8 GB thumb drive (no support at all for 4 GB).